Multipurpose, extremely customizable, clean design. Get a glimpse of how powerful and versatile this theme is. Hear what people like you have to say about Virtue Premium. 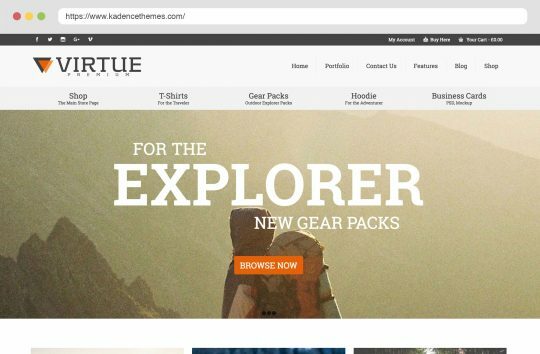 Virtue Premium has options for different unique header styles. You can have a logo centered with menu above, below or beside as well two menus in the header and a widget area. Part of the options in virtue is the ability to have a boxed layout or full layout. Virtue is ready for Woocommerce in a big way. Lots of extra features included like custom tabs, radio button swatches and layout styles like multi column grids and single column lists all styled with clean lines. 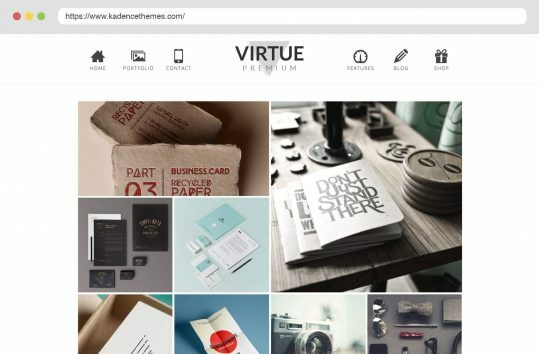 With Virtue you can create awesome portfolio style grids to show off your photography, design or projects. Virtue premium has multiple column grid sizes and mosaic styles. Show of your posts in grid or list layouts with images, sliders and videos right on the archive pages. Virtue has four different post loop outputs. Virtue Premium comes with a powerful options panel that allows you to adjust and create. Select your colors, choose your backgrounds and layout styles. Pick from any of the 600+ google fonts and create as many sidebars as you need. Everything is here to fully customize your site. Unique layouts are a breeze with Page Builder you can drag and drop what you want how you want it without ever touching code. SiteOrigin Page Builder is part of the Virtue's recommended plugins. Take control of your page and create layouts that take your site to a new level. Kadence--- you're a rare breed. I never leave theme reviews because I'm usually so disappointed in the product that I just want to forget I wasted my time and money. HOWEVER, Kadencethemes has renewed my faith in Developerkind. Finally, a company that delivers what is promised. Thank you Kadence--- you're a rare breed. Keep up the amazing work. Recommended for everyone wanting to build a beautiful website. 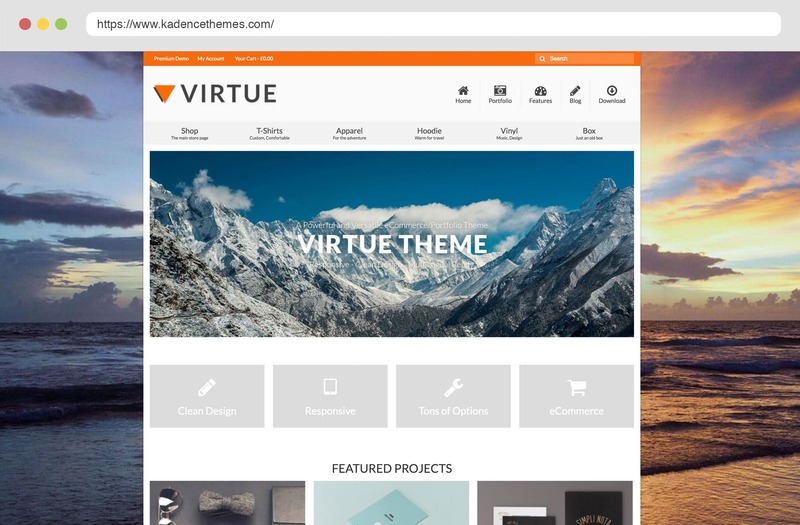 Virtue is an amazing theme built by amazing people. There is virtually no end to how much one can customize virtue. An to top it all, the team at Kadence are always available to help you when you need it most. Their fast response and sensitive approach towards your queries, however big or small, it what makes them stand apart from the rest. The Virtue theme is highly recommended for everyone wanting to build a beautiful website. It's the best value for money that you can get. Perfect! I've been using the Pro theme for months now, and it's worth every penny. I'm finally in love with my website! I don't know what part is better, the theme itself (code and design), technical support or forum. So many fantastic, beautifully designed and useful elements in this theme. And it is updated regularly! I was recently looking through some other themes out there looking for some new elements and features. Came here to check something before I bought a new theme and realized that this one was updated and has all the new features/style I was looking for. Forum is full of useful stuff and if you need something more specific, tech support will answer all your questions and more. Thanks guys and keep up the great work!! The amount of content you get with Virtue premium is simply staggering. The authors did a fantastic job of making the theme intuitive to use and easy to handle. You can go from being a complete Wordpress novice to making clean, professional looking Websites within two weeks. A pleasant surprise was the huge amount of support the theme authors Ben and Hannah provide on the support forums. If you're ever in a bind or need a helping hand, these guys will take a look at your site and have always got some custom code to spare. 5/5 Stars and worth a lot more than the asking price of 45$. Virtue is a fantastic theme, and the support from Ben and Hannah have been absolutely amazing. I highly recommend Kadence. Trust-me, I tried (too) many Woocommerce templates: Virtue Premium is a great theme, very (very) well coded and documented. And the support is AWESOME! The value is amazing for such a low price! Great theme, Great support and Great product. So easy to have a great looking website. With little experience in web design and no CSS knowledge, the Kadence support team has devoted a significant amount of guidance in helping us tweak their very handsome Virtue theme. Very Happy with the clean look and feel. Many Thanks. I have been absolutely blown away by Kadence. The level of support is unparalleled - even if you're using the free version of a theme. I am very wary of products and pay a lot of attention to the reviews. I was apprehensive of the negative comments left by other users, but after using Virtue, I can only assume that those leaving negative comments had not fully explored the features, or if they did, failed to utilise them. 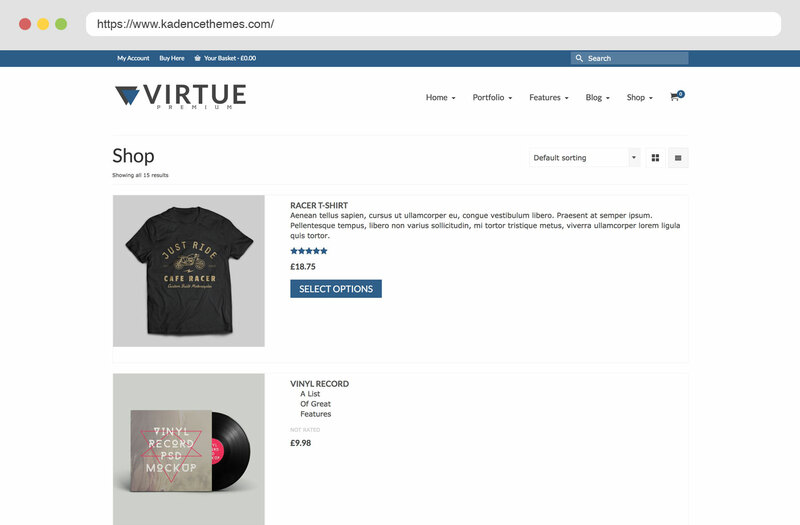 Virtue is a truly brilliant theme that can be customised to such a degree that no two sites look the same. Tons of options, you can customize pretty much everything. The theme looks great and support is awesome. Worth every penny. I work with this theme in many projects. It is perfect for e-commerce sites, blogs and simple business websites. It has many great functions. And I love the way haw quick and professionally support team responds. Thank you very much! Love this theme! I tried so many themes but Virtue is the best. User-friendly design and excellent customer support. Virtue Premium is a fantastic theme! It is very feature-rich, and everything works correctly. In addition, the support forums almost always already have the answers to any questions I may have, including custom CSS. On the rare occasion when I've had to post a question, it was answered in a timely, concise way, and my issue was resolved quickly. I cannot say enough good things about Virtue Premium and the support staff! One of the best themes ever! You can do what you want, really adaptable for any situations. Furthermore, the support service is awesome! Try to believe! 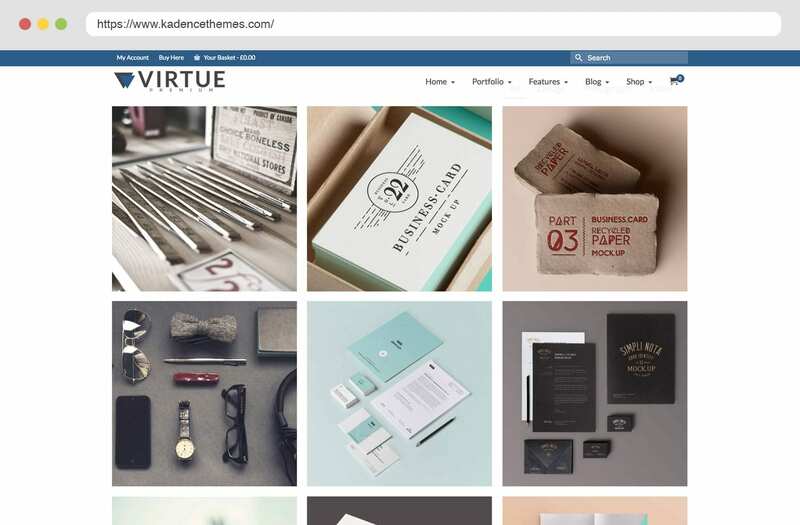 The Kadence Virtue Theme is clearly the best WordPress Theme out on the web. Well written code that is constantly updated by the developer as technology and security progresses. The design, features and the user experience is truly amazing. If I could give it 10 stars i would. This is the only theme I will use on my WordPress sites. Special thanks to the developers. This is amazing! Excellent Theme! Great support from Ben i never built a Website before but Ben made it possible, couldn't be any happier. Thanks Ben! greatly appreciated.!! I had never built a website before and knew nothing about coding. After fumbling around with a number of free WordPress themes, I tried Kadence's Virtue. The quality, features, and usability were so good I bought the premium version within a week. I am also impressed by the number of updates since my purchase. Clearly, Kadence has made a commitment to the continuing development of this quality product. My only complaint is that the video tutorials are not as well thought out as the theme itself, and a bit rushed. But don’t let that dissuade you. There are some good YouTube tutorials on Virtue, and overall the support has been good. If you are new to web design, you couldn't ask for a better theme. I'm not a 'review-writer' but need to add my accolades and thanks to Kadence for their excellent theme "Virtue", and fabulous support. When you're struggling alone at your desk trying to make things work the way you need to and shoot a support call out into the ether, and actually get a response in a TIMELY WAY from a knowledgeable person who is very helpful... is there anything better than that? That is true Customer Service The updating and usefulness of the Kadence tutorials and support forums also shows an ethic of excellence - much appreciated. 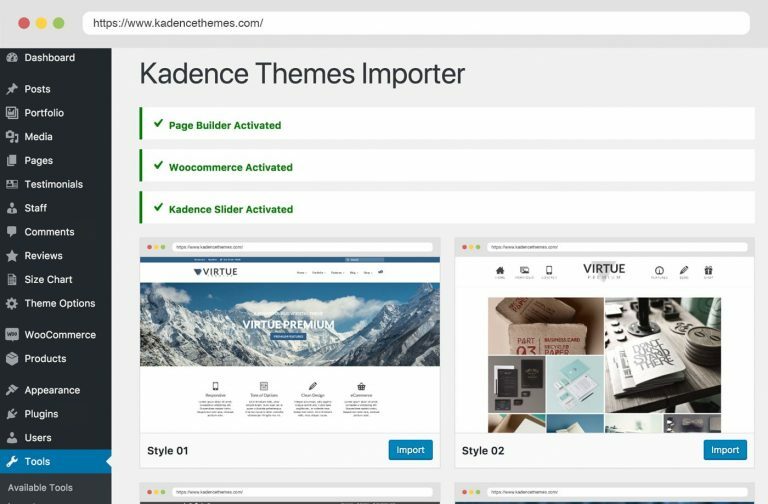 Kadence Themes support team is amazing! It's so hard to find support like this these days. Keep up the great work! 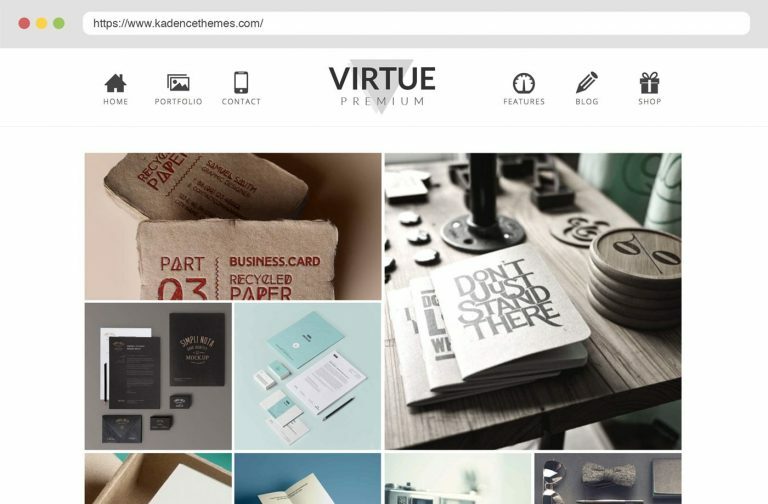 I used Virtue Premium Theme during the last 2 years and it is just awesome! It let built my website fast and easy. By the way, the Kadence Staff are also incredible. Great customer service! THANKS!!!!! The best wordpress theme ever! I am using Virtue Premium from the very start, for a few websites and it is perfect. When everything goes down and you are on the edge (something is wrong with some other theme or something), I know that I have Virtue theme to solve the problems. It has everything you need. Code is perfect. Customization is user friendly and endless. Support - super fast. Kadence - lifetime respect! I bought Virtue theme & very pleasure about it. - The support team quick reply & kindly with help. If Kadence themes were simply about the themes, they would be awesome. So beautiful, So elegant. So simple to use and yet so astonishingly feature packed, honestly anyone and everyone can use them to build an unlimited variety of websites. But truely, a Kadance theme is more than just the code and it's features. It's stellar quality is about the people whgo built it, the support team that runs the support forums and is on hand daily to ensure whatever problems you run into, they can help you find a solution. That's what makes this product 5*, and that's why I recommend adence themes to everyone. Simply put, you won't find better. Love the products and support team has never let me down. Highly Recommended! 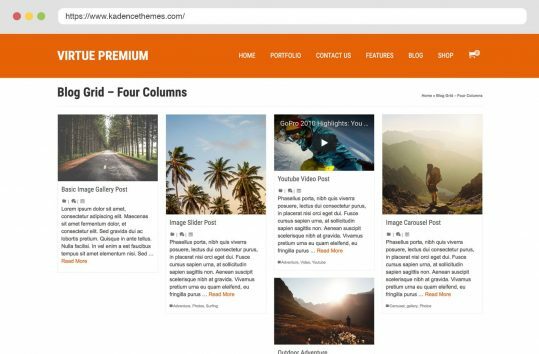 I've been using the free versions on a couple of websites and loved them - so I decided to buy a premium membership, as the author of these themes deserves the (small) amount of money you pay for all themes. 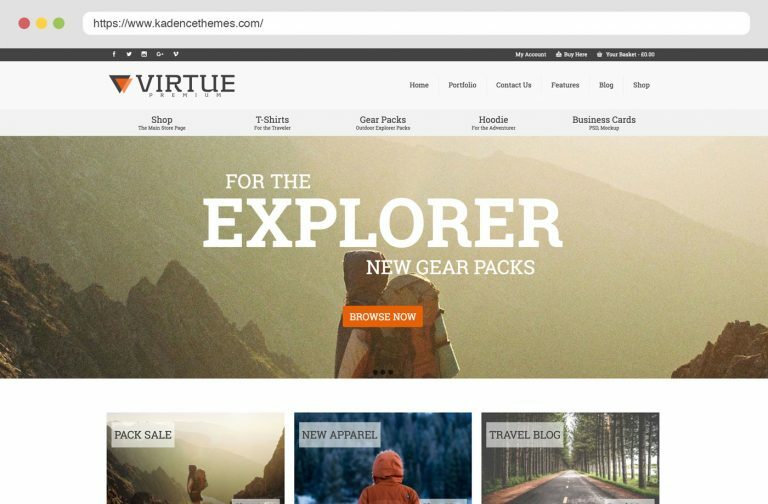 In 2 years of trying various themes or site builders, Virtue was / is my most preferred choice. Highly recommended! Best and flexibel premium theme for building a WP website. Responsive support. Worth every cent. Strongly recommend to build your project with this theme. It gives you wide ability to customize your site and deliver best user experience. A very good theme, highly recommended. Excellent themes and plugins, excellent support. Need I say more? Awesome support and beautiful theme! Been using it for a year now and I just love how customizable it is! Absolutely LOVE both Virtue and Pinnacle. The support is amazing too. Amazing. Simply amazing. I've been using the free version for over two years and I finally paid $45 for the pro theme. All I can say is outstanding! I never thought I would stray from Studiopress or iThemes Builder, but this Virtue Premium theme is amazing and so versatile. It's my new favorite theme and the support is amazing! Thank you Ben and Hannah. My absolute favorite theme. I have used it for nearly a year now, and it performs beautifully. Thank you! Theme is beautiful and support by Ben is unmatched from my experience. This is absolutely a beautiful theme to work with and easy to customize. The support is amazing - quick, responsive, and helpful. wonderful beautiful theme with tons of options Highly recommend this theme support is excellent. I have changed many themes but finally got the perfect virtue theme. Awesome theme, real clean look, and crazy amount of customization. On top of that the support is awesome! Best 45$ I ever spend on a theme! Best Theme so far to ever to be compiled, Way worth It's money. I would give the Virtue Premium theme more than 5 stars if I could. Although I do have only the standard version at the moment (going to upgrade soon), I can see very well the benefit of it. 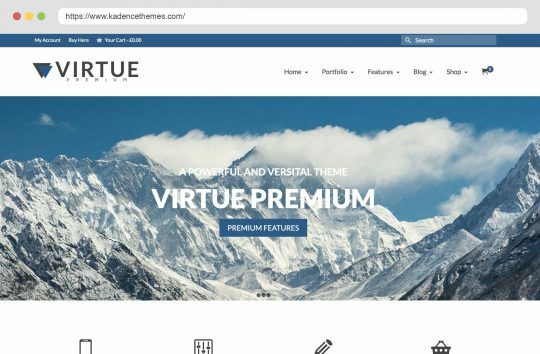 I have tested many themes over the time and for me, I like to compare Virtue Premium only to Responsive Pro. 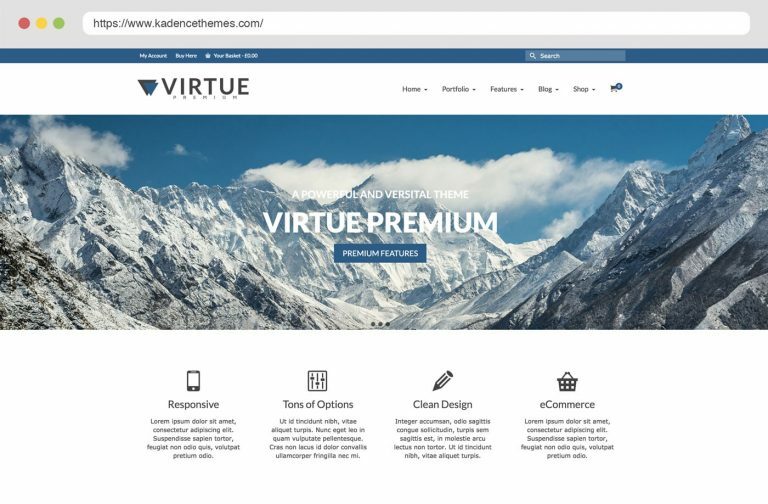 The Virtue Premium theme is perhaps better, depending on requirements, and for sure, excellent in features AND printed support (such as tutorials)! Nice piece of work. Probably one of the best themes I´ve ever used. Great support. Clean looking, easily customized, and able to adapt to a number of use cases. That, along with the great AND quick support, leaves me with no option but to say: great theme :) keep it up. Great theme, does basically eveything I'd ever need! Terrific theme and, just as important for me, great support. Best experience I've had in since beginning in web design. Looking forward to trying out the Pinnicale theme soon! I’m a FIRST TIME wordpress website user and it has been so easy for me to configure this theme. Ben was a fast responder to a "HUGE" question I had, which turned out. It didn't have anything to do with the theme. But he helped anyway! I’m so thankful I found Virtue! Take a look at my website... Not bad for a Newbie!!!!!!! I purchased the virtue premium and recommend doing the same to everyone, the best investment you can make. It is a very functional theme with lots of features and easy to use. What makes it really outstanding is the support behind it. The support team responds quickly, thoroughly and patiently. I have never seen this kind of support anywhere else, simply amazing! Clean, solid theme. Support is wonderful! Virtue is, for me, the theme to supplant all themes. I'm just wrapping up my second conversion from "other things" to Virtue Premium and couldn't be happier. Virtue is so flexible and full-featured, you can (and I did) create sites that look entirely different from each other even though they're based on the same theme. Without examining the source code you would never know it. That's not the case with many other themes on the market, some at considerably higher cost. I appreciate your help and quick response. I am creating this website here through your Virtue Theme for my wife. She also has another website that I paid someone to create and have never been happy with that site. I have access to the admin on that site and have changed it so many times myself through frustration with the person who created it, that I felt comfortable creating this one myself. When I’m finish with this one I will switch her other site over to the Kadence Theme. I have looked at many themes before choosing this one. FYI, I chose this one because it looked like it had versatility, and great support. Both turned out to be true. I started with the free Virtue and switched to Premium because the premium seemed to be the “complete package”. This also turned out to be true. I know very little about creating websites but I don’t know why one couldn’t create any style of site with the Virtue Theme. Thank you again for your great support! My first wordpress site, and it was so easy to do using this theme. And it looks great too! A big THANK YOU for the designers! Absolutely great theme - and also great support! This is the most amazing theme i have ever used. The free version already has incredible tweaking options than som many other premium woocommerce themes out there. This theme is GREAT! I am an art teacher turned blogger, turned website designer (translation: not a techie) and I LOVE this template!!! I've used it for two new sites, and Ben has been SO helpful in answering all my questions within hours. I just couldn't be happier with all the endless tweaking that the template allows, Ben thought of everything when he put this together. I never dreamed that I could actually design my own site, and make it look exactly like I want. Thank you Kadence Themes! Ok so, Ben is amazing. I use BOTH the free and premium themes and they're both fantastic. They're super responsive and really easy to use. Both versions are amazing and i'd say he went above and beyond for the free version. 5+ stars for you, Kadence Themes! Also, I've bugged him numerous times with silly questions and he always gets back to me right away and is super helpful. If you're here and debating on wether or not to get this theme, GET IT. You're at the right place. En tant que Webmaster éditorial, je ne peux que recommander sans réserve ce remarquable thème WP qu'est Virtue Premium. Je l'utilise pour créer et maintenir mon "site-portfolio-blog" personnel. J'ai apprécié les multiples possibilités de personnalisation qu'il offre, son responsive web design, les possibilités d'ouverture vers la traduction de pages ou encore le e-commerce ; on tire la quintessence des possibilités de WP grâce à un tel thème. Cerise sur le gâteau, Ben, se montre très disponible et réactif pour répondre à mes sollicitations. Un grand bravo et un grand merci à lui. I am new to using themes for web design. I do know html, and css. After purchasing the Virtue Premium theme, and using it for a few days, I was amazed what I could do. The support side of this theme is absolutely amazing. The response time to questions is super quick. I am 110% pleased with this theme, and 120% pleased with the support team. If i was to purchase another theme these guys would get my business. I have used the free version for quite a while now although I have paid versions of the two best sold themes on themeforest. I would say it is the best free theme available, full of functions and easy to customize. Now I am changing to the paid version. Reason for that is that I want to support the development; it's only fair to pay a reasonable price for a top product. Second reason: I want the sticky header! Thanks again for a wonderful theme! 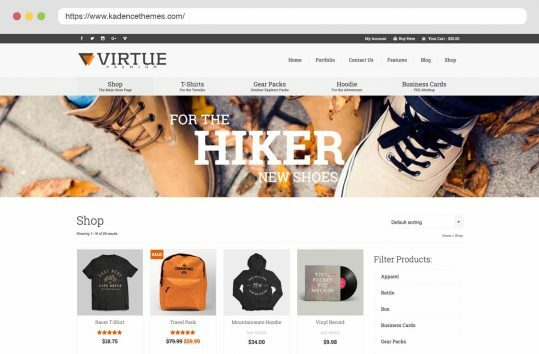 I tested many themes then by accident I get across a video showing how easy was setting an e-commerce using virtue and woocommerce. How I'm not a good developer I tried the Virtue theme following the video instructions and by the end it was easier than imagined to set a basic e-commerce site. Two days later I decided to get the premium version to have all the available options as well as a support that revealed to be the best and faster support I experienced since two years I use wordpress. Yes, I strongly suggest anyone to get this premium theme cause you can use it as you like, your fantasy is the only limitation. Thank you Ben and company to offer such a great product and support. Excellent theme !!! support is super fast , the paid version is well worth it. Very happy i chose Kadence Themes for my websites !! Keep up the amazing work !! Very nice and flexible theme. It has a clean design and is easy and fun to work with. The support is superb. Highly recommended! This is the best theme I have ever come across. Coming from a background of near zero experience to now getting my ideas out and making functional websites, this theme has been perfect. Highly recommend the premium version for anything looking to make a serious impactful website. The support from Ben is top notch. This theme is really something. I've been working with it for a couple of weeks and I start to like it more by the day. So many options and then some. I ran into some minor problems, but Benjamin from Kadence themes sorted me out very quickly! Gardaş tema bir harika, ellerine sağlık, allaha emanet ol, götüne mukayyet ..
Really fabulous theme and I can safely say Ben has been a champion solving some issues with my own configuration. I would have no hesitation in recommending this theme to anyone. I love this theme. It's beautiful, clean, and easy to use. I love this theme. The theme as alot of built in option which is great. I looked at a lot of themes on wordpress and this is the best by far. Virtue is truly a beautiful piece of artwork. As a fellow web designer, I can truly appreciate the clean and minimal approach that Ben takes to this theme. I highly recommend it, and to boot, the price is ridiculously worth it. If you are consider using ANY Wordpress theme, stop looking now. Join Kadence Themes Premium and experience the difference. There is no comparison. Honestly. If I had only discovered Kadence Themes soon, I wouldn’t have wasted 5 years on themes that constantly had issues, horrible tech support (or none at all) and limited functionality. Kadence Themes out perform any other Wordpress theme I have used. (Don’t want to publicly shame anyone, but I used some of the biggies.) 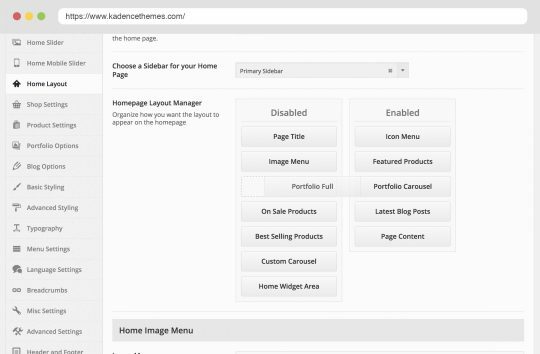 Kadence Themes are highly functional and configured for clean responsive performance. And the options in configuration are staggering! The support you get here is stellar. No attitude. No limits on the number of times you can contact support. Always friendly, helpful, responsive and gracious. And you actually learn a lot in the process. 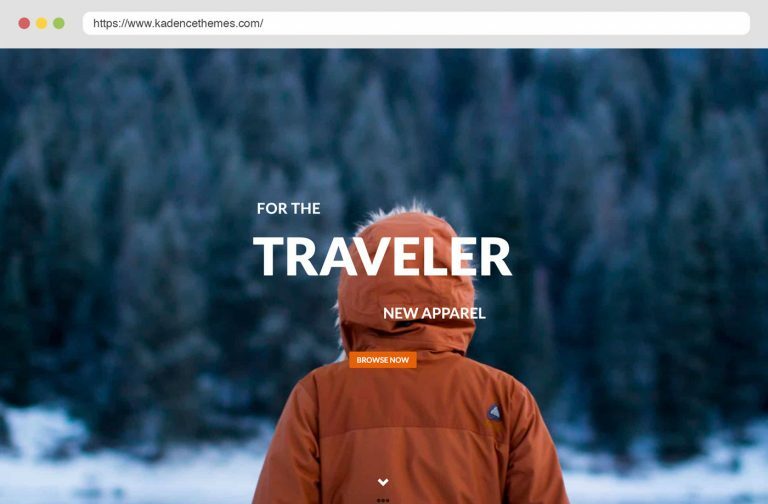 As a result of my experience here at Kadence Themes, I will not be using any other themes in the future. With the versatility of these themes, any design layout is possible. Thank you, Ben (developer), Kevin and Hannah. You actually make setting up a website enjoyable. Kadence is the only way to go! Finally, I love my websites for myself and clients. 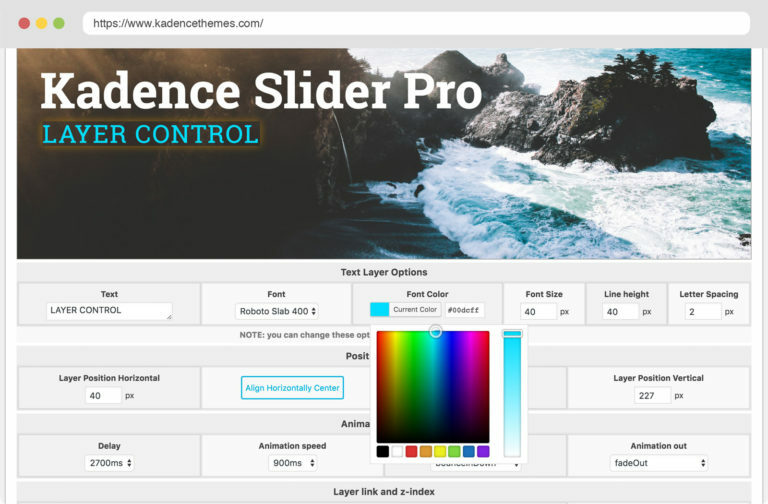 Kadence Themes are not only well-designed and highly functional, the tech support is stellar. I have purchased a variety of themes in the past and been consistently disappointed with the functionality of the theme and the technical support of the developer. Thus I have NEVER offered a review of ANY WP theme…until now. I was raised if you can’t say anything nice, don’t say thing at all. But when you encounter an exceptional product and service, scream it from the rough tops. 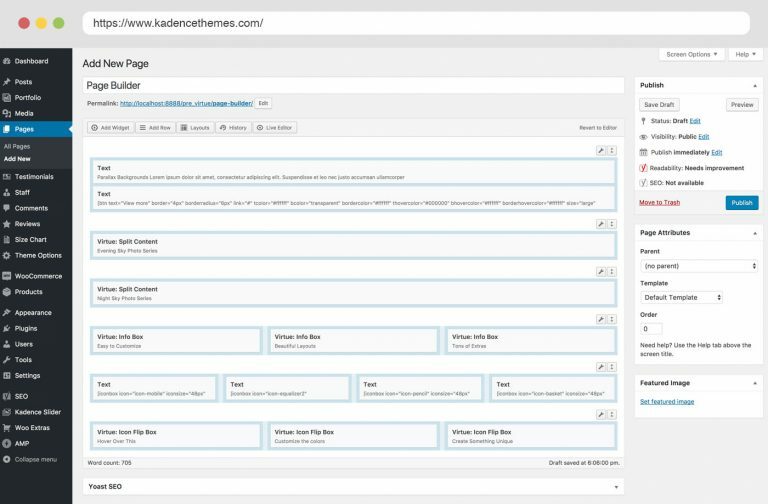 As a result of my experience in the past, Kadence Themes are the ONLY WP themes that I will be using the future. Each design can be tweaked and modified to suit any application. And you if you need a little guidance along the way, full membership grants you the ability to get premium support which is priceless. Hands down the best WP theme on the market. Stop looking. Start using Kadence. I'm absolutely impressed with the value for money! Beeing able to make/maintain my own website is important. With the help of the support team I was able to not only do that, but make it look professional and interesting as well. I even got my " first lesson in scc". You should know that this work is not my profession, this language is not my native tongue and this development is not "my generation" (I still used to work with telex and telegrams and thought the first faxmachine was a revolution). So if I can do it, you guys can get anyone on their way. Thank you so much. So far so good. Straight forward. Lots of functionality. Really nice theme. Top notch support! A truly amazing theme which extremely easy to use. This is the theme i will use for every website i will ever maker. Ever. I bought the theme since Feb 2013. I am really impressive with the theme support. They always help me and give me the suggestions every time I need. I never had any theme problems since I bought. Highly recommend for everyone who is looking for the multiple purpose theme and GREAT support! Wow I'm impressed I just paid the 45$ once but every month the theme keeps getting updated and improved and we have constant support in the forum. I have no idea about web coding and I'm making great websites. Best theme I have seen. A perfect theme. Just everything you might need + fast, correct and useful support. Easy to manage, user friendly and easy to use back end. Reasonable price! just compare the functionality and the price with other pro themes on the net! Das Template ist perfekt, soviele Konfigurationsmöglichkeiten und mit der Customer CSS kann man problemlos sein Template anpassen, ohne das es beim nächsten Update überschrieben wird. Clean design, massive functionality and intuitive design options. Perfect for unlocking the potential of your site. I can't say enough good things about this theme and especially the support from Kadence. If something is not working, they will provide instant help to get everything the way you want. Thank you for everything you are doing! 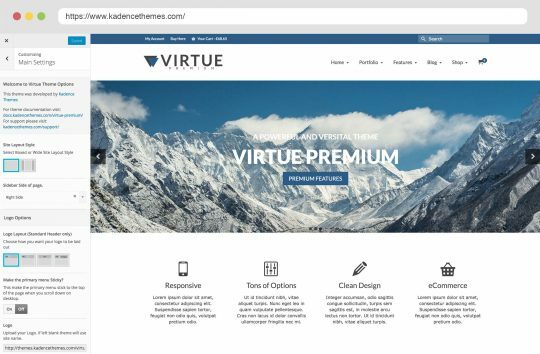 I purchased the Virtue Premium Theme and have been so impressed with it and the fantastic support. 6 stars from me! I absolutely love this theme! Professional WordPress at its best! Ingenious to say the least! I'm very impressed! 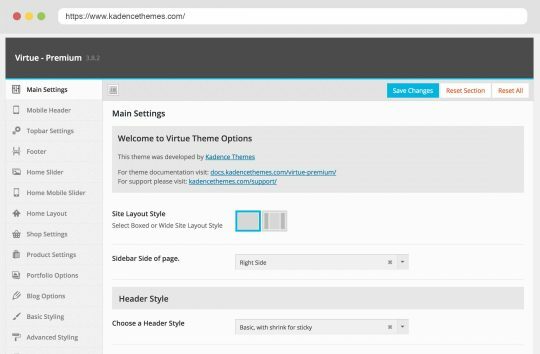 By far Virtue theme Premium is my most favorite deployed in a WordPress installation. Initially used the free version for a previous project and upgraded to the Premium version for my latest endeavor. In addition, the support following purchase remains to be be top self and timely. What an amazing theme! The options are plentiful and the support is wonderful. Worth every penny and then some! I think it's hard to understate the value you're getting with Virtue Premium. It's an excellent and attractive theme packed full of features and other add-ons/plugins (some of which are priced at around the cost of Virtue Premium alone!). In addition, the support team is responsive, helpful, and professional. 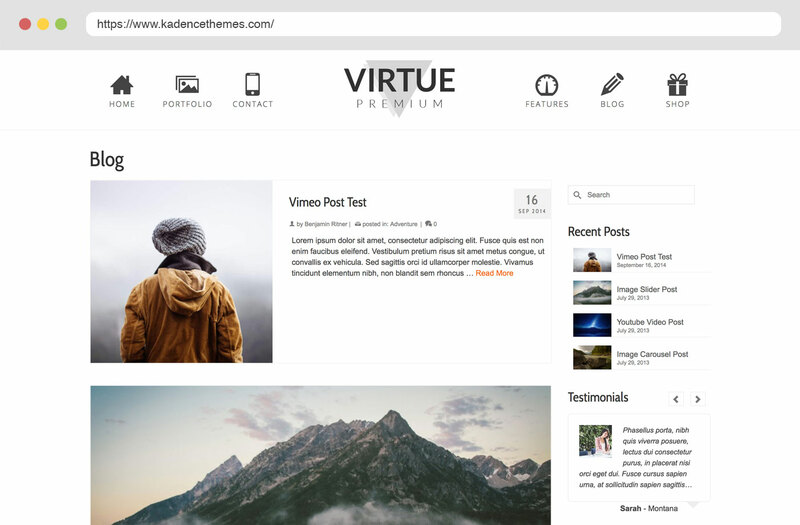 I would highly recommend Virtue Premium to anyone considering purchasing a premium WordPress theme. 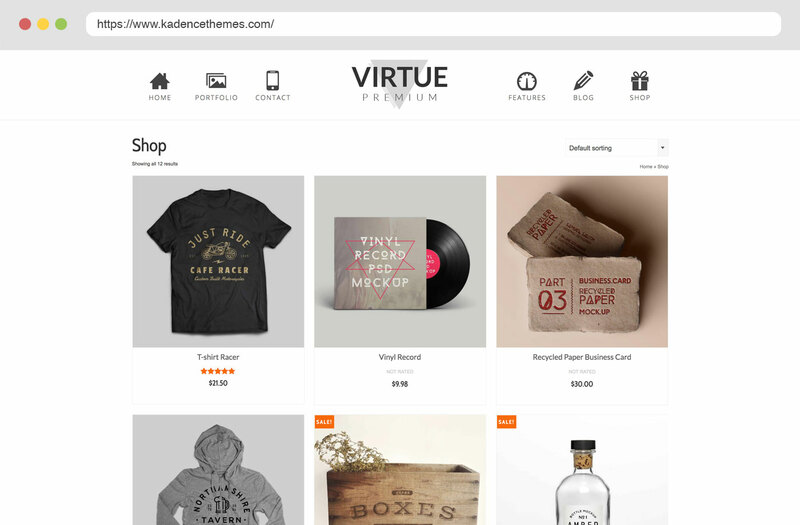 A designer's dream - excellent customisable built-in features, Woocommerce support out of the box, and a tool-set that can adapt to any type of website from business sites to creative portfolios and online shops. I can't see the need to use any other theme for the forseeable future! I very highly recommend this theme. After building a Wordpress web site with this theme, I can say I will definitely use it again. Good built-in features and it is easily customizable with a little knowledge of CSS. Five stars because of the quality of this theme but more importantly, the excellent, top-notch customer support and the huge amount of information available in the forums. Thank you Kadence Themes! Great theme, great customer service , great support (prompt answers when you need it). Highly recommended. I've never built a website. This theme is so clean, modern, user friendly, and the support from Ben and company is second to none. Buy this theme!! This is the best, most versatile WordPress theme with amazing support. We're going to keep purchasing it again year after year just for the support. The best $45 we've spent, for sure. By far the one of the best Premium Wordpress Themes available. Awesome features, and the ease of changing the look is purely great. It is well worth the $45. The best theme on which I have spent money. 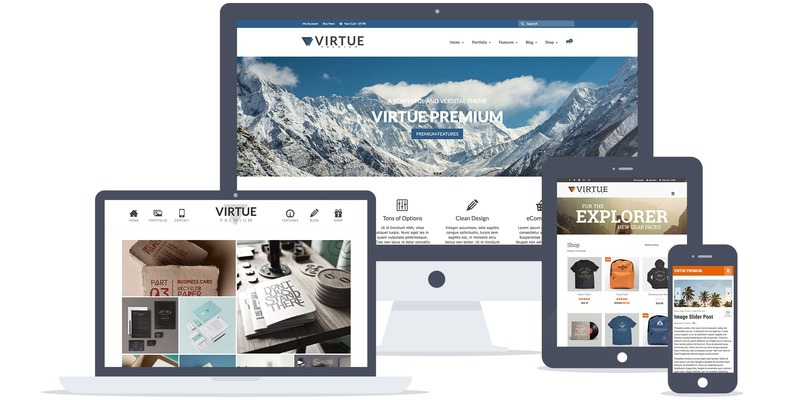 Virtue Premium WordPress Theme is the most powerful and versatile theme I have purchased. Highly recommend. Fantastic theme and support. Worth the $45. Thanks Ben. I have been delighted with this theme and with the first-class support from Kadence. My web skills are very basic so I often have to ask stupid questions, but I always get sensible, helpful replies! My site looks extremely smart clothed in Virtue Premium - and all for about thirty quid. Brilliant. I love this theme. I recently upgrade to Virtue premium, it is worth every cent. 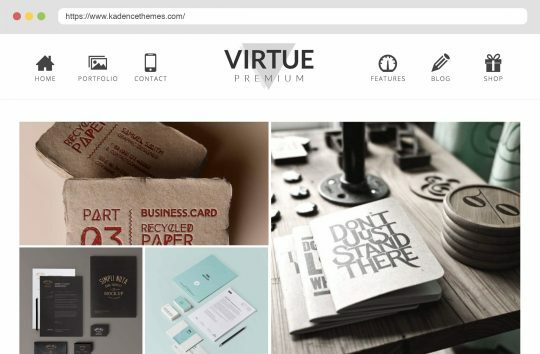 If you are looking for a high end, easy to use theme with lots of features buy Virtue premium. the best theme I have found, hands down. I have used a lot of premium themes. My new site has benefited hugely from Virtue premium. What a great theme and fantastic support. I had an issue and it was fixed very quickly. Great all around. Worth every cent. Well worth the $45, has nice features that are not included in the free version. This is an absolutely amazing product and the post sales support and is outstanding.I had never built a web site before and got a Wordpress site hosting service from GoDaddy. 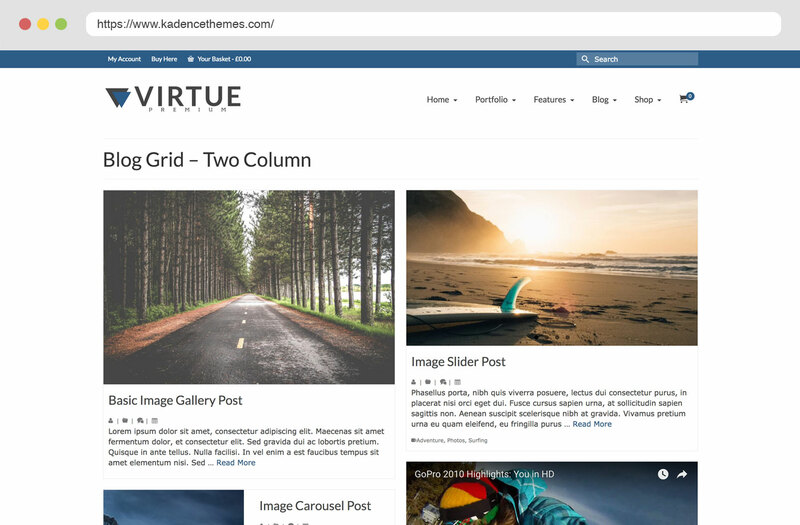 Was not sure how to start and after looking at many different responsive themes chose Virtue because of the the configuration options. I did not want to write any code at all. We eventually upgraded to Premium as I wanted a number of premium features (including the slider shortcode). The responsive theme works well for desktop, mobile and tablet and we have tested all of the functions across multiple devices. So with very very little work I got my whole web site up and running and my client is very very impressed. This is without doubt one of the best productivity tools you will ever buy. Amazing theme, the best by far I've ever used, works perfect, worth the 45$ and a lot more! Virtue Premium is by far the best theme I have ever used, and Ben's support is way beyond any other developer. I had my site up and running in just a few hours. My rating is 100 out of 5 stars! Very flexible, very good and cool support !! Best theme so far !! I said WOW! With my Heart Beeating - (beating spelled wrongly on purpose to express how I felt!) - This is a Very clean theme - Ready to Go on activation. Thumbs Up! Just excellent, easy to use and setup. I think this is the theme I had been searching for. The varieties of theme option settings makes the difference with any other free wp themes. Thankyou ! I freed up 1 week to rebuild my Dad's site - with content, functionality and all - from Joomla to Wordpress. The number one requirement: responsive, "mobile first" design to view the site consistently on all devices like phones, tablets and desktops. Number two, quite frankly, make it easier to maintain the site himself, while at the same time give him more power over the look-and-feel of the site. Thirdly, of course, it should look stunning with the use of wide graphics and controls like the carousel, video posts, etc. 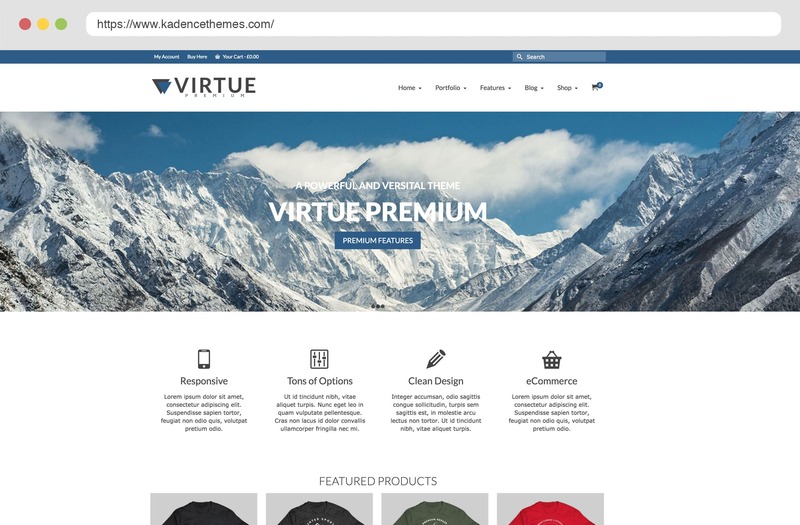 With the Virtue Premium theme and the blazing fast support of Ben of Kadence the transition went butter smooth, giving time to enrich the site with additional features. It the month I've been using it numerous bug fixes and functionality have been delivered - the change log suggest my short experience was no exception. Besides being a beautiful theme, Virtue is by far the most inclusive and versatile theme I have purchased. The support is far better than any theme I have purchased, and the documentation is off the charts. Great theme and very professional support. It's pleasure to work with Ben. One of my absolutely favorite themes to use. Incredibly versatile, packed full of options, all the bells and whistles. Easy to navigate and understand! I have only been in the word press world for a short time. This theme was a pleasure to work with and the updates has only proven that I have made the right choice. If and when i get stuck, It's not hard to sit back read the theme documentation and have an ah ha moment. It has truly been a pleasure working with this theme. Thank you for providing us with a beautiful work of art. This is the best Wordpress theme ever! It has endless possibilities and features, even in the free version. Everything is self-explaining and easily customizable. As soon as I have tested all options the free version offers, I will definitely buy the premium version. This was made by true artists. Thanks for taking the time and effort to create and share this theme. Really nice theme. Clean, stable, tons of features, frequent updates and enhancements - but the best is the support from Kadence and Ben - none better! I'm a first time wordpress website user and it has been so easy for me to configure this theme. Ben was a fast responder to a question I had and I'm so thankful I found Virtue! Beautiful theme...amazing.It has so many features.I am using the free version and still it gives so much options to play around. I can't say enough good things about how awesome this theme is! In addition to the theme, there's actually someone in customer support to answer questions you may have. I would highly recommend recommend Kadence Themes to anyone! GREAT theme and GREAT support! Highly, highly recommend!! Probably one of the best themes I´ve ever used with my customers, cause it´s easy to use and includes tons of possibilities. I just love this theme! Beautiful theme with a lot of functionality. Worth the $45. Seguis haciendo cosas como esta.